These proposals were entered even if the constitution promotes freedom of conscience, religion, and speech as does the European Convention which is Bulgarian internal law. The initial version was so restrictive and we described it as worse than the communist law of 1949. We filed legal papers with parliament and other government agencies analyzing the detrimental legal effect the new laws would have on the church and a free and just society. The proposal envisions that no services or prayer could be held but in government-approved buildings; no support or donations could be received from abroad for churches; that all churches would have preachers and ministers registered and that registry should be provided to the government; that no preacher or minister would be allowed to minister unless graduating from a government-approved theological school; that all local donors should be reported to the government and so on. After 7 months of opposition to the proposed highly restrictive changes to the religious law in Bulgaria, we were able to successfully defend freedom of religion and speech for believers. The proposed bill, entered in May of 2018 and passed through committees and the parliament in October through December 2018, was essentially overthrown in most of its restrictive parts. Many shared our view, and literally, ALL religious faiths opposed the bill. Yet, the evangelicals put up possibly the strongest opposition to such repressive government measures against belief and expression of faith. 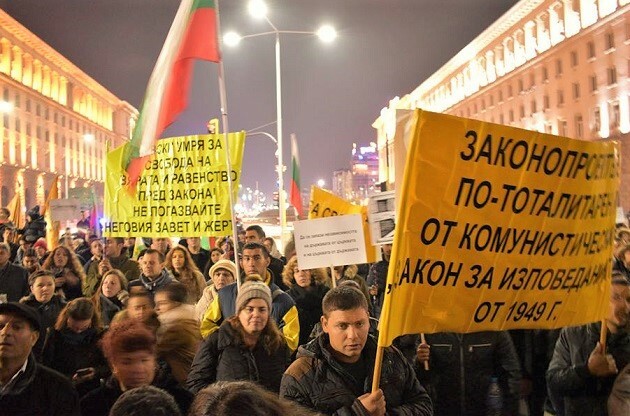 However, this opposition would likely not have happened, or at least not to the extent of the participation of the evangelical church (1% of Bulgaria) without our insistent explanation of the dangers of the new changes to the religious law. It is our opinion that our participation in a one-hour show on Bulgarian Christian TV station of revealing analysis rallied the church to understand and prayer within this spiritual battle. As a result of our numerous consultation with churches, pastors, members of parliament from various parties, participation in the parliamentarian Commission on Religions and Human Rights, and upon our recommendation, evangelical Christians took to the streets to express peacefully express their disagreement with the totalitarian limitations to faith and freedom by the state. The nation of Bulgaria had not seen so much prayer in public for the authorities since the fall of communism. The end result was that the law still passed in parliament at the end of 2018 and was enacted in 2019. However, almost all of the restrictions, due to legal critique, international pressure, legal, political and spiritual, were withdrawn. Few of the initial restrictions were adopted, thus the task to stand for freedom remains, but those can be challenged in the courts. The biggest victory was probably the way in which the Bulgarian evangelicals, used to being pushed into the corner of society and used to see themselves as a community that has no public importance, was able to publicly declare its stance for justice and religious freedom. The Lord used this national constitutional crisis to embolden His followers in Bulgaria to not bow to Caesar but to Christ, and that is the greater part of the freedom we fight for. May He continue to give us boldness to proclaim the Gospel of truth and salvation in Jesus Christ (Matt. 28:16-18). We will also continue, by God’s grace, to work with church leaders to train them in both the law and the Scriptures to withstand the pressure and continue with worship and mission in Bulgaria. ← Is the defense of religious freedom a legitimate Christian ministry?